The Mission in Guaimaca has lived 12 years trying to respond to the call of Pope John Paul II to work as one Church in America. It was in the year 2000 that the Diocese of Fall River sent Fr. Paul Canuel and the first team to Honduras. Our Congregation sent Sr. María Ceballos as part of the Diocesan team. The community was established in the year 2004. Now Bishop George Coleman needs Fr. Craig Pregana in the Diocese of Fall River and communicated to Cardinal Oscar Andrés Rodriguez the end of the commitment and ministry of the Diocese of Fall River in Honduras. Fr. Craig was appointed Pastor of Our Lady of Guadalupe Parish in New Bedford, and Director of the Hispanic Ministry in the Diocese. Cardinal Rodriguez needed to appoint a new pastor for Santa Rosa de Lima Parish in Guaimaca. Among the things Fr. Craig did when he first came to Guaimaca with College groups was clearing and cleaning the grounds where today we have the Marie Poussepin Center. Later on he asked Bishop Coleman to be assigned to the mission in Guaimaca where he has been for eight years. He has been the Pastor for the past five years working earnestly to reach out to all the communities and especially the youth. He has been a good support with our students at the CMP, where he came to celebrate the Eucharist, to give Bible classes to the older students, to be part of celebrations on special days and to bring the monthly birthday cake! Our last Eucharist and celebration with him at the CMP took place on June 25. The students expressed in different ways their gratitude to Fr. Craig and remembered, through a Presentation, some of the memorable moments lived with him throughout the years. Saturday, July 14th, was the Installation of the new pastor by Cardinal Oscar Andrés Rodriguez. It was also a thanksgiving Mass not only for the 12 years of presence of the Diocese of Fall River in Guaimaca, but for the 8 years of ministry of Fr. Craig Pregana in the Parish. The Church was standing room only and many were outside. There were people from the city and from the different villages of the Parish, a good representation of the City Officials, TV Channels, young and older parishioners. It was an expression of gratitude and love, as well as a sign of the growth of the community with a large presence of the youth. The Cardinal’s homily, based on the readings of the day, which spoke of being sent and of caring for the community, emphasized both the gift of Fr. Craig to the Parish he had ministered for eight years, and also the fact that he was giving the parish from the best of the Archdiocese in the person of Fr. Jonathan Funes, a young priest with many talents. It was a day filled with emotions and gratitude as well as expectations. Fr. Craig will certainly be missed. We hope to be able to work with Fr. Jonathan in such a way that we can help the transition thus becoming a time of grace for the parish community. As far as the many people and groups that have contributed to the mission and want to continue doing so, it will also mean an adaptation. However, it is helpful to know that Fr. Jonathan speaks English and counts on their support. One of his main concerns is the financial aspect. On Sunday, July 15th, both Fr. Craig and Fr. Jonathan celebrated the last Eucharist in their own parishes. Many people came to St. Rose of Lima Church, not only from the city but also from the villages, to express their love to Fr. Craig. The different Pastoral groups from the parish expressed their gratitude in different ways and the young people did it in the evening Mass. Fr. Craig’s departure was on Monday, July 16th. 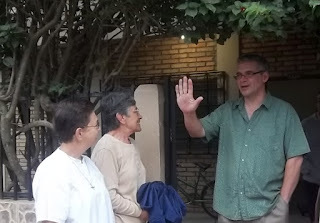 Early that morning many of us gathered outside the rectory to give him a “serenata”. We sang songs we know he likes and others in relation to Honduras, the land and the people he now loves deeply. We were concerned he had little time to prepare himself to leave for the airport. However, we were happy to see how he did not seem to be in a rush and was enjoying every minute of it. We sang more songs and he offered us some coffee.... very much acculturated! Fr. Jonathan arrives to Guaimaca on Wednesday, July 18th, and will celebrate his first Eucharist in the evening. He is certainly not a stranger to us. Some of us have known him since 2007 when, as a seminarian, he came to give a vocation retreat to our students at the Marie Poussepin Center. It was then that we heard him singing for the first time. He is not only gifted with a good voice, but with lots of feeling and faith expression in his songs, many of them composed by him. Later on, Fr. Jonathan came with other seminarians for his pastoral experience the year previous to his ordination as a deacon. He came also a couple of times to offer concerts in the Parish. 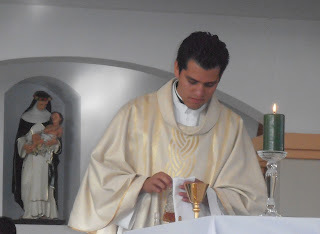 As a young priest, he can offer good formation to our young people. it is a time of transition, and a time of new life. We certainly count on your continued prayers and support.